Arundhati Roy's essays about the failing light of democracy reach U.S. shores. At almost any given moment one may stroll the streets of urban America (unfortunately, I can't speak for the hinterlands) and observe what appear to be human beings perambulating (the boulevards) while staring at their palms. This, you may guess, is the voodoo mojo of the smartphone in action, which some commentators may point to as one more sign of the decline of civilization. Not wanting to be identified as such a naysaying declinist, I would more point to a startling and hazardous symptom of a diseased body politic: namely the renaissance of the Know-Nothing Party (in mid-19th-century America also known variously as the American Party or the Order of the Star-Spangled Banner). Today the appellations "right-wing nutjobs," "Republican noise machine," etc., injudiciously fail to take seriously the nasty pathology gaining traction in the land and certainly don't address the objective conditions that allow it to escape its petri dish of disease to infect large numbers of otherwise healthy citizens. Thus it is a small comfort to read someone intelligent and humane addressing the rising tide of our troubles. 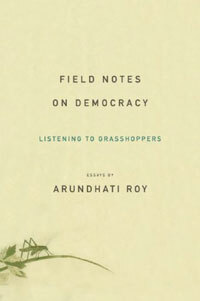 Indian writer and activist Arundhati Roy, best known for her Man Booker Prize-winning novel The God of Small Things, has a new collection of essays, Field Notes on Democracy: Listening to Grasshoppers (Haymarket Books) that (ironically) Time magazine hails as "Gorgeously wrought...pitch-perfect prose... In language of terrible beauty, she takes India's everyday tragedies and reminds us to be outraged all over again." The irony being that if you replaced her examples and case studies and applied them closer to home, Time would either ignore Roy or work to defang and declaw her. ...Could it be that democracy is such a hit with modern humans precisely because it mirrors our greatest folly--our nearsightedness? ... Our amazing intelligence seems to have outstripped our instinct for survival. We plunder the earth hoping that accumulating material surplus will make up for the profound, unfathomable thing that we have lost. The notion of Democracy and the pleading for human compassion first came together in Sophocles and the Greek tragedies. More than two thousand years later we live under an economic world tyranny of unprecedented brutality, which depends upon the systematic abuse of words like Democracy or Progress. Arundhati Roy, the direct descendant of Antigone, resists and denounces all tyrannies, pleads for their victims, and unflinchingly questions the tragic. Reflect with her on the answers she receives from the political world today.